Vacation Fun Day 2: So it's the summer which means that you are either on vacation, just back from vacation or counting down towards vacation. In the spirit of my vacation this week, all of this week's posts are going to focus on office supplies and time wasters to help you while away the hours. So you and I both know that Twitter is an incredible resource for work: breaking news, a hive mind ready to answer your questions at a moment's notice, the latest memes...but your boss has this annoying habit of hovering and does not believe that people can be productive with social media open on their desktops. 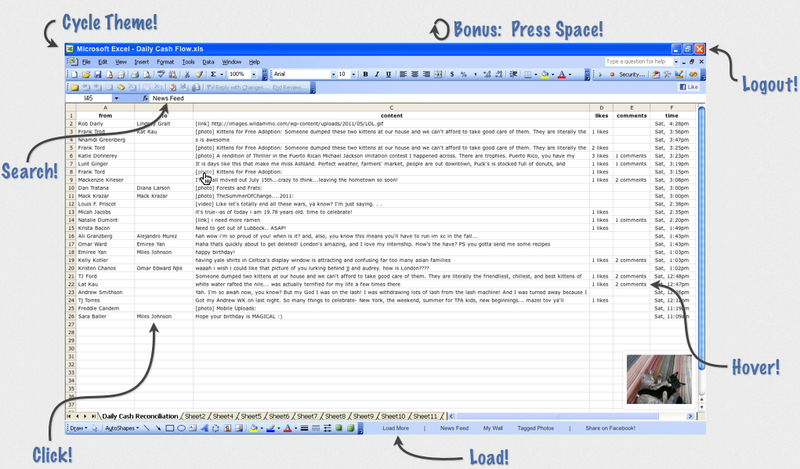 Enter HardlyWork.in a web app that can convert your Twitter and Facebook accounts into benign-looking spreadsheets! The app has a keyboard shortcuts, hover capability and simple functions to help you reload or filter your newsfeed as you "work". No one walking by and casting a glance at your computer will be any the wiser.